For the first time, all eyes were on influencer marketing at this year’s Content Marketing World (CMWorld) event. During the final session in the influencer marketing track, Traackr’s Founder & CEO, Pierre-Loïc Assayag, led a panel comprised of both brands and agencies (and all customers of Traackr) to address a popular topic: influencer marketing problems. 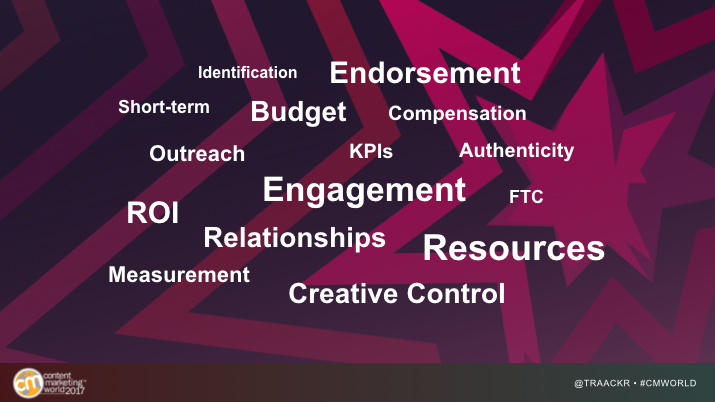 What stands in the way of a successful influencer marketing practice? Unfortunately, there’s no shortcut for success in influencer marketing. The solution is complicated. But, we’re all in this together. Every brand has a journey with influencer marketing. 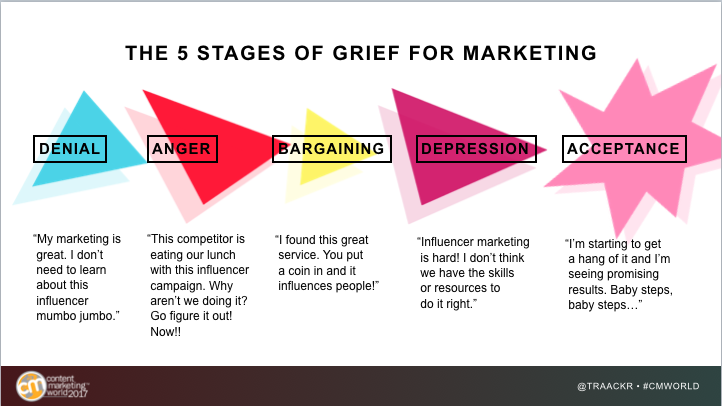 Whether you are still in denial or feel like you are about to arrive at acceptance, most marketers can pinpoint where they currently stand on this spectrum. “For agencies that have the urge to keep influencers close to you instead of your brand clients, this is the worst mistake you can make to earn money. And here’s why: when programs get brought in-house, budgets get multiplied by 7X. And what’s the fastest growing part of the budget? The agency portion. You’re actually increasing your share of the overall pie, in a pie that has grown 7X. Everybody ends up winning in this context. The worst thing is to hold your clients back simply because you want to manage the tactical campaigns." We’d like to thank our influencer marketing superheroes and also everyone that attended the session. It was a lively conversation and we hope you found the insights to be helpful! To continue your learning, we hope to see you at next month’s live webinar featuring Mark Schaefer and Evy Wilkins, which explores the rise of influencer marketing in leading technology organizations.